…. I wish you a belated Happy Birthday! I’m preparing for a meeting, so I got nothing at the moment, except some photos of wacky white-tailed deer, hanging out on campus. The shrubbery … is it crunchable, preciousss? Also, latecomer blogger is late. 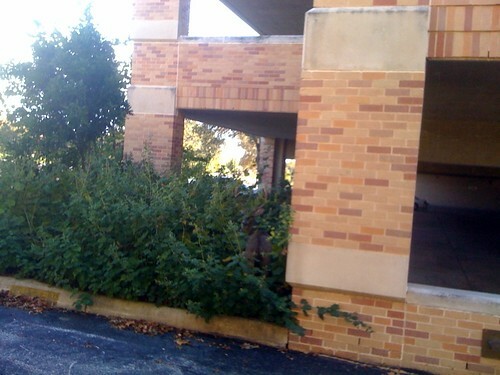 This entry was posted in animal control and tagged bring_us_a_shrubbery, deer, fluff. Bookmark the permalink. 3 Responses to Deer OT …. Oh, cool! Looks like he let you get really close, too – must be a regular visitor! That kind of sighting always makes my day. I’ve never seen a deer in the city, but lots of coyotes and raccoons – and there was even a black bear in the heart of downtown Vancouver on Monday! Apparently he hitched a ride into the city on a garbage truck that had just made a stop in North Van, which has tons of bears (my sister-in-law has had one in her garden on many occasions). They managed to dart him and move him to a more suitable habitat, unharmed but probably rather freaked out! I thought for sure he would bolt when I got out of my car. Nope, just stayed put and looked at me when I got out my iPhone. I went into lab and worked for about an hour or so (this was on a weekend), and when I came back out to the parking lot, three deer were still grazing nearby, on the lawn near the library. The buck was standing on the sidewalk, facing me – he actually started walking towards me, and it was a bit intimidating. Junior also stood his ground, but the doe trotted away from me immediately. Deer are pretty common in town; there are lots of small wood pastures connected by dry riverbeds. There’s a pack of coyotes in my neighborhood – I hear them howling and yipping almost every night. The little dogs are terrified by those sounds. We’ve got loads of coyotes in Toronto, too (they live in High Park, which is kinda sorta like Central Park in New York I guess). 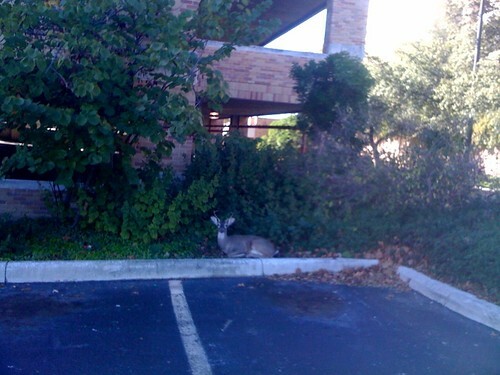 And probably deer, although I’d be extremely surprised to see either on the downtown University campus. I hope none of your Texan colleagues decide that deer hunting on campus is a good idea.